River access on the left bank is quite easy from canoe. If one wanted a place to see and experience the Cahaba River - this tract provides many opportunities. 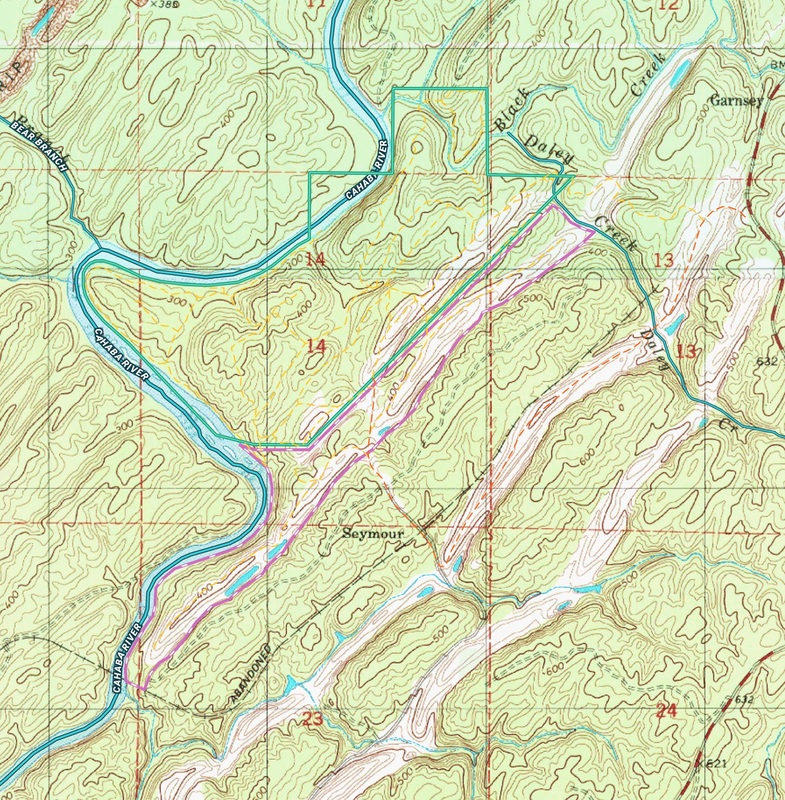 This tract is a short distance upstream of the Cahaba National Wildlife Refuge. You could canoe from here to the Alabama River. Rocky shoals are habitat for many of the rich species the Cahaba is famous for and this is one of the best habitats for snails, mussells, crawfish and a large diversity of fish. Clean, clear water is the habitat for an abundance of aquatic snails. The Cahaba Blue Way is a canoe trail that will stretch the length of the Cahaba. Higher river levels this fall. Lilies that grow on this stretch of the river. Road that goes along the river for more than a mile. Large white oaks along the river road. One example of the many places cane grows along the river bank. The river alternates between deep pools and shoals. The peninsula along the river was hit by a tornado in 2011 and is coming back with all the right kinds of plants - river cane, sycamore, river birch, alders, tulip poplars, oaks, paw paws and more. There is about 200 acres of very mature hardwoods with a large variety of oaks, hickories and maples. The property has some steep topography, especially as you get close to the river. One of serveral well maintained roads on the property. One of the steep hillsides showing the mature forest and understory. View of the river from one of the ridges this past summer. View of two bends in the river from the top of a ridge road. Black Creek on the north forty acres of the property. One of the rock out croppings along Black Creek. large beech trees along Black Creek. Privet is present on this property but is hardly as invasive as it is in other parts of the river. Black Creek that flows through the north 40 acres on the property. It adjoins the Freshwater Land Trust property. One of several greenfields and hunting stands. Tornado damage in 2011 on about 15 acres. A large portion of the east half of the property was mined for coal, this is the restoration. View from the green field on the north forty looking southwest. The east border of the property where the land has been mined has been develped into beautiful greenfields with pine plantations surrounding. View looking down at the diversity of hardwoods. Some small areas on the east side of the property have planted pines. Small camp house with power and well water. Property has a cover for equipment. There is one large transmission line easement. There is one remaining methane well on a corner of the property. A long lake from older mining days that runs along the east border. Upstream is Living River Camp, large tracts of Forever Wild land and the new Shelby County Cahaba Canoe Park. River access is very easy from almost all of the 1 3/4 miles of river frontage, unlike some stretches with very steep banks that come right to the river’s edge. The sounds of clean, clear rushing water are as alluring to people as they are to the snails and mussells that populate the shoals. Many of the places along the river are hard to access or are on private lands - this tract has easy river access as well as a road along the river that is a great hike. There are almost 200 acres of mature hardwood forests on this property that have not been hit hard by industrial timbering and mining. Looking southwest from the mined lands to the mature hardwood forests and the river beyond. Just upstream from the Cahaba River National Wildlife Refuge and just down stream from the Shelby County Cahaba Canoe Park and Living River Camp, is a jewel of a property along the Cahaba River with 1 3/4 miles of easy access frontage along the Cahaba River. The river frontage is a series of deep pools and shoals where Cahaba Lilies bloom in the spring and the aquatic diversity of fish, snails, mussels, and craw fish are abundant in the clear, clean water. Islands, rare for the upper Cahaba River parallel the banks of the river creating more habitat for otters, beaver and wading birds. The ease of river access from the bank is exceptional. There is a long road that parallels the river most of the length of the property. The 200 acres of mature timber is a rich and diverse hardwood forest rolling over steep hills with some breathtaking views of the river from the ridge tops. Excellent roads allow access to all parts of the property from the ridge tops to the deep valleys of Black Creek as well as a long road along the Cahaba River providing very easy access to the river. The miles of hiking along these well maintained roads are superb. Black Creek, a beautiful deep canyon stream whose banks are lined with mountain laurel, ferns, Florida anise, wild azaleas, paw paws and beech trees; flows through the north forty acres that adjoins the Freshwater Land Trust property. A comfortable camp house with power and well water, is located in the center of the property with a nice long front porch. There is a power line easement as well as an old gas line easement that runs through a portion of the property. The east side of the property has seen coal mining and methane drilling, leaving a long narrow lake full of fish, lands reclaimed with young pines, one methane well and some good roads leading to green fields with hunting stands. 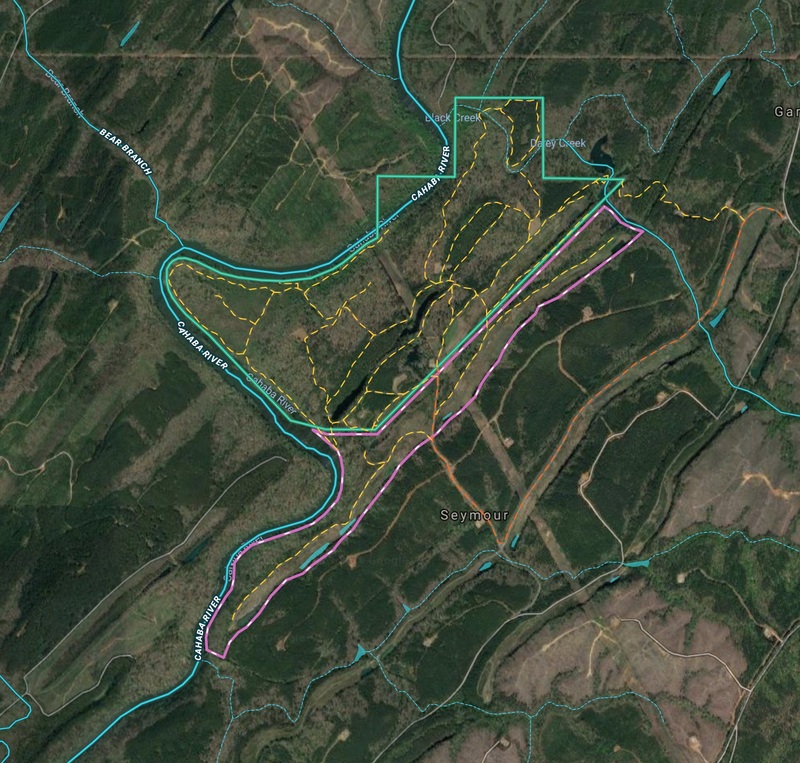 In addition to the 352 acres that is for sale, there is 146 acres of privately leased land with roads that would extend the frontage along the Cahaba to over two miles and within a few hundred yards of the Cahaba National Wildlife Refuge northern boundary, and the acreage to 498 acres. The leased land could be purchased. Contact Beth at 205-533-1513 for pricing or to schedule a showing.